About ten years ago I was talking excitedly with a friend about what I envisioned the near future. Internet connectivity, I said, would eventually become a cloud – I was ahead of my time – which would invisibly surround us and allow us to be constantly connected. I pointed to my cellular phone – then a relatively sleek model with a monochrome screen which allowed barebones web surfing – and told him this would be the primary conduit for many to that cloud. His response? "It sounds like a nightmare, Steve." Ten years on it was he who may have been ahead of the curve. If Emily Nagle Green's predictions in Anywhere: How Global Connectivity is Revolutionizing the Way We Do Business comes to pass, our cellular phones and almost everything else we own will be plugged into the Internet, simultaneously empowering us with any information we care to know but also monetizing our lives and every action on a scale that business could have only dreamed about in the past. Green posits that we are on the cusp of what she calls the Anywhere Revolution, a world where billions leverage the power of the Internet for their every need, trillions of devices – from your phone to your toaster – share information, one where physical location becomes increasingly irrelevant. Wireless technologies – both present and those yet to be rolled out – will spread the benefits of constant connectivity to what will eventually be the entire globe. Even the Third World will eventually reap the benefits of this revolution as they skip entire generations of existing technology in favour of mobile, constant connectivity. 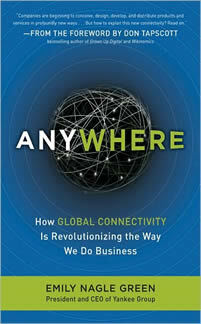 Though Green discusses the social benefits of the Anywhere Revolution, Anywhere is obviously geared to the business world. As CEO of Yankee Group – whose work she nearly exclusively cites in this book – is well-placed to offer advice. She discusses strategies for firms to take advantage of Anywhere, expectations of consumers and how business itself will be transformed by global connectivity. Any CEO hoping to catch their breath during the second decade of the World Wide Web revolution will find themselves disappointed. The tectonic shifts in business that cheap telephone rates and the Internet brought over the past two decades will pale in comparison to the issues that executives will have to face during the next two decades. At its most benign, the world that Green sees coming to pass is attractive. It's one that sees hospitals use their resources to the fullest, parents who can work from home and spend more time with their children, Third World farmers getting the best prices for their crops and an aging population everywhere live more independently, among other outcomes. Consumers will have increased power while business will be more responsive to the needs of customers. It's a limitless future where almost everybody has access to the full-range of human knowledge where ever they are, unlocking what could be a staggering growth in the intellectual and social evolution of humanity. It's like Star Trek but without the uncomfortable form-fitting uniforms. As libertarians are fond of reminding us however, there's no such thing as a free lunch. A world that sees our refrigerators tell us that we're low on milk is also one that sees the same appliance deliver advertising telling us where we can buy that milk. The price of constant connectivity, as many Blackberry addicted executives have found out, is that we can't easily disconnect. Owning a cellular phone presumes that you are always available so why aren't you answering the phone? And who gathers all that information that we generate and can we trust them with safeguarding our privacy? Both the private and public sectors have a poor track record with that concern. All things being equal the reality is that it will likely be a noisier world, as our private lives are increasingly interrupted by work and advertising disguised as help, but also a potentially more fulfilling one thanks to global connectivity stitching the world closer together. The ubiquity of information that we're already experiencing promises to revolutionize the parts of the world long denied access to it. And just as Anywhere largely avoids the nettlesome questions of privacy and the inevitable interventionism of governments, it's a future that still has some outstanding issues yet to resolve before this techno-utopia can come to pass. As for me? I try not to carry my cellular phone all the time now. It's my own personal off switch. Steven Martinovich is the founder and editor in chief of Enter Stage Right.